Get sweeping views of the South Island of New Zealand during a 40-minute scenic flight from Milford Sound to Queenstown. The one-way flight offers an aerial perspective on the Southern Alps, Lake Wakatipu, Sutherland Falls, and Milford Track. When your pilot gently lands at Queenstown airport, a driver transfers you to your hotel. Make your own way the the Milford Sound Boat Terminal to confirm your flight with Mitre Peak Cruises. The staff checks the day's weather conditions and confirms your departure, then transfers you to the Milford Sound Airstrip. 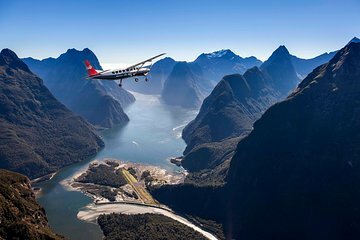 Once on board your aircraft, take off and soar over Fiordland National Park. You'll get panoramic views of Sutherland Falls, the Southern Alps, and Lake Wakatipu, along with the glaciers, mountains, fjords, and lakes of the South Island. After about 40 minutes, your airplane touches down at Queenstown Airport. From there, your driver transfers you to your Queenstown hotel.